The SKB 14 x 26 Marching Bass Drum Case is a revolutionary roto-molded D-shaped drum case with molded in feet for upright positioning and stability. Featuring sure grip handles with a 90° stop lifting and transporting is easier than ever. The patented Roto-X pattern adds durability and allows the case to be easily stacked and stored. 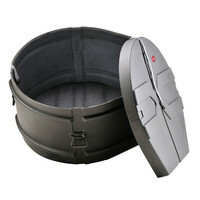 This bass drum case from SKB is an affordable drum protection solution that is complete with a padded interior perfect for any gigging drummer.